Early one morning I opened the garage pedestrian door to find a huge moth on the side trim. Right away I considered him "ours" since he'd slept overnight in our doorway. What a beauty! He didn't seem to care that I was within inches of him, so after getting a few pictures, I put my finger out to see if he would crawl on it. He did! How lovely! Photos are great to have when you want to remember all the details of some critter so you can check the field guides to figure out what it is that has been visiting us here at Bluebird Cove. It's amazing how many things are similar so without photos I would not have much hope of knowing what I saw. My books (see below) helped me determine that was a Cecropia Moth which is 4-6.3 inches across, the largest moth found in North America. You can see why it was such a beauty at that size. Since the female lays 200-300 eggs, only a few at a time in one place, you would think you'd see more of these huge moths, but they fly only at night. You can attract them by leaving on an outside light against a wall that they can rest on. Set your timer and check every 15 minutes to see what you attract. We also see tree frogs when we do that. You will need to have some of the plants that the larvae (caterpillar) stage of this moth requires since that will be where the female lays her eggs and where the caterpillar will eat, spin a cocoon and emerge as an adult. The preferred trees are cherry, plum, elderberry, poplar, oak, sassafras, dogwood, apple, box-elder, maple, walnut, birch and willow. Our property includes half of those. 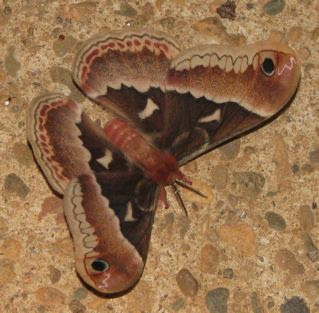 The moth in its adult form shown here does not eat, so it only has two weeks to live. It's sole purpose is to find a mate and lay eggs. 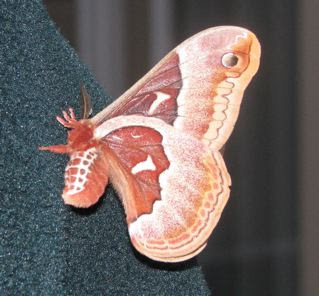 I loved getting the side view of the abdomen when Randal later went out the door for a walk and had the moth fly on his arm. He seemed to enjoy the ride, or maybe since it was light, he was just too sleepy from his night's work to care. This appears to be a male because they have larger feathery antennae than females. These are sense organs for the male, enabling him to detect chemicals given off by the female who emits pheromones. In this way, males locate females in the dark of night. Males can fly for miles in order to reach a female. After mating, the female spends the remainder of her life laying eggs, while the male mates several times. Wash Jar and Recycle or Trash It? Do Animals Love Each Other?